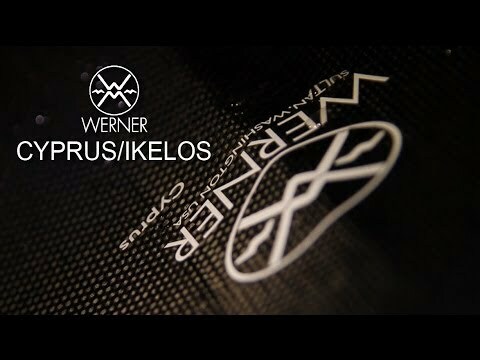 The Werner Cyprus is Werner's most popular Performance Core high angle blade design kayak paddle. The mid size performance core blades fit a wide range of kayakers and are versatile to use during advanced maneuvers or all around touring. Great paddle! I wanted something with a smaller blade than my Warner Corryvreckan to reduce shoulder and elbow wear-and-tear during long days covering long distances on flat to choppy water. Expensive, for sure, but light weight of carbon and flotation of blades really appreciated the more often I use it. Ferrule system works well, though should be protected when traveling with the paddle broken down. I am told the ferrule is a point of structural weakness that can break, but this requires a fairly extreme force. If you are an extreme paddler, get the solid shaft version. Altogether, well worth the price. Can be used in a range of settings. I couldn't find it any cheaper anywhere else. The paddle is terrific, but like any carbon fiber paddle with black blades, it is important to put something on the blades so that the paddle is easy to see, whether by passing boaters or if it gets dropped into a log jam. I have decorated mine with my name and phone number in gold mailbox letters, plus stickers that show the Great Lakes in neon colors. Looks sweet and no-one will accidentally pick it up and claim it as theirs! I've owned this paddle for more than a year now and can't say enough good things about it. Weighing in at only 23.25 oz, this is one of the lightest paddles out there. The full carbon blades are perfectly designed and can take all the abuse I put them through while paddling around the shallow marshy waters down here on the Texas coast. The paddle is perfectly balanced, gives me the choice to feather at multiple angles, is handcrafted here in America, and built to last. It's also available in the 250 cm length that I need while sitting in the high position on my kayak. The price may scare some people, but if you're serious about kayak fishing and spend as much time on the water as I do, it's worth every penny. This paddle is a thing of beauty. Made right here in my neck of the woods. It is worth every penny. I have borrowed one from time to time and longed for one for a while. It is light, powerful and moves through the water like butter. I love it. I received this paddle as a Christmas present and It is an outstanding present. Took the paddle out on New Year's day and found it to be powerful, light, and easy to use. This paddle makes me look like a better kayaker, it really is that good. This is the best paddle I've ever used. It's smooth and powerful. The weight is incredibly light too, obviously, plus it's a very strong paddle and can take some abuse. After upgrading to a new boat, P+H Cetus (awesome), I did the same with the paddle and bought the Cyprus. It's awesome too. To be honest the first time I was out with it was weird. It's so light I felt like I was just flailing my arms around! Took a little getting used to. But once in sync it is great. Despite its' weight it is rock solid. I found the perfect setup with the adjustable angle shaft. Feels totally smooth. Yes it is expensive. But after a recent long day on Lake Erie it felt like a bargain to me. If you do longer trips and it fits your paddling style I highly recommend it. These paddles are ultra light, ultra durable, and very rigid. My fly rod weighs more than these. Also undamaged after I had to use it as a shovel to dig my car out of the sand. Q: Werner Cyprus Carbon Kayak Paddle Straight Shaft - Do you have this paddle in 210cm, small shaft? A: The Werner Cyprus Carbon Kayak Paddle Straight Shaft is available in 210 cm in a small shaft for this price. If you would like to order, simply call or email customer service at customer@austinkayak.com or 888-828-3828.